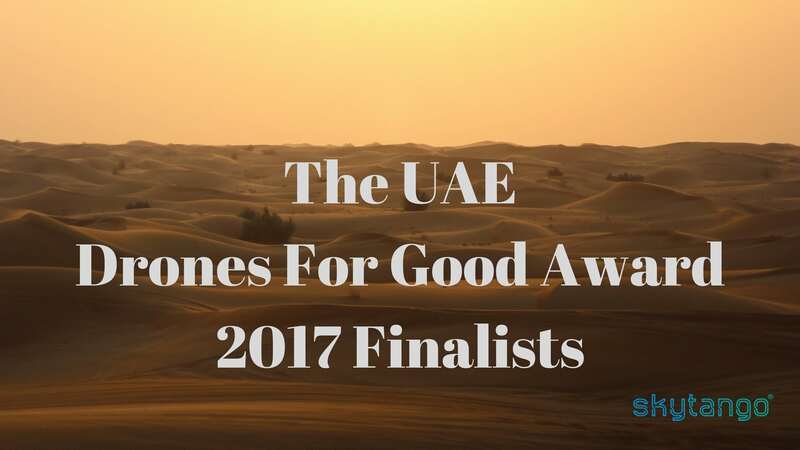 Take a look at the finalists of the UAE Drones For Good Award – a competition dedicated to transforming innovative drone technologies into practical, realizable solutions for improving people’s lives. The UAE Drones For Good Award is a year-long competition organized by the United Arab Emirates Telecommunications Regulatory Authority and Information and Communication Technology Fund. Launched in 2014, it aims at encouraging useful and positive applications for drone technology and, with a significant prize of $1 Million for the international winners and UAE Dhs1 million for the UAE winners, it’s the largest competition of its kind. The 2017 edition of this competition, sponsored by Dubai Internet City, Samsung, Digi Robotics, and MakersBuilders, attracted over 1,000 contestants from 165 different countries and the 40 best local and international teams were shortlisted for the awards. The Finals were held in the technology park Dubai Internet City on 17-18 of February 2017. Practical and innovative solutions ranged from traffic control and smart oil-spill solutions to drones for rapid evacuation. His Highness, Sheikh Hamdan bin Mohammed bin Rashid Al Maktoum, Dubai Crown Prince, reviewed projects and technologies of the participating teams and honored two teams as the winners: Sanad Academy’s Smart Ring and Nokia Saving Lives. Sanad Academy is the United Arab Emirate’s first Remotely Piloted Aircraft training and certification specialists endorsed by the Dubai civil aviation authority. Their team won the UAE 1Dh million prize in the national category with their invention “Smart Ring”, a drone capable of locating drowning victims and offering immediate assistance. “Smart Ring” is a fully waterproof, amphibious system, infused with innovative drone technology within its body, enabling GPS positioning and radio communication features. “You do not need a lot of skill to use it, it can be used through the mobile app. The drone can fly, but also can go to the victim in the water and save them. You can also have multiple rings sending signals to each other”. Nokia won the UAE Drones For Good Award in the International category with Nokia Saving Lives, a project aimed at facilitating efficient rescue operations for first responders by bringing instant communication services through a network of specially equipped drones, which allow uninterrupted rescue work. Network connectivity is often compromised in disaster situations, hence it is the first priority in rescue operations. Only six teams made it to the finals last year. This year’s competition was brimming with exceptionally innovative and intriguing projects. Let’s take a look at the finalists. Avy Rescue: hybrid formula drones, purposely developed to support SAR missions at sea and other not easily accessible areas, combining the flexibility of multicopters with the higher range, velocity, and payload capabilities of wing-borne airplanes. Avy Rescue is easily deployable and can operate in the most diverse and unprepared for conditions. BioCarbon Engineering: Loss of trees is also a loss of healthy ecosystems, biodiversity, raw materials, food, and jobs. Using powerful emerging technologies like remote sensing, robotics, and machine learning, BCE created an autonomous aerial planting system to enable industrial scale reforestation. It is a cost-effective and scalable solution to drive eco-system restoration. Drones4Right2Life: groups of UAVs cooperatively aiding the rescue autonomous surface vessel (ASV) and permanently monitoring and tracking the most problematic migrant routes. Whenever one of them detects a troubled vessel, GPS coordinates are sent to ASV, which then rushes to a location to supply basic survival kits and floaters to the people on board. Drones for Search and Rescue: drones equipped with radio scanning systems and deployed over earthquake, tornado or other disaster areas, capable of locating victims stranded below a few meters of rubble and wreckage by detecting cellular, WI-FI and Bluetooth signals. Finder: human detection system built to identify human heartbeats and breathing rates and assist in locating individuals wherever they may be. Microwave sensor modules and software algorithms are used to detect living people in buildings, culverts, walls, vehicles, edifices and structures of all materials and varied densities from a stand-off distance. Firefly: autonomous Artificial Intelligence and computer vision platform that allows the drone to autonomously and efficiently navigate through apartments in search of stranded people, providing firefighters with immediate and accurate information. This rapid-evacuation platform can be imported to any drone in the world. Skycart: The only fully automated drone delivery service at the moment, helping hospitals, courier services, restaurants, and retailers to reduce their shipping costs. IntelliDrones: a fully automated intelligent management system for drone fleets, supporting the main features: real-time flight path tracking and re-computation in dynamic environments, as well as autonomous and wireless inductive charging automation, making it a convenient solution for unmanned missions in potentially risky and hazardous regions. Mine Kafon: there are an estimated 100 million active landmines worldwide, with 10 innocent civilians killed or maimed by these explosives. Mine Kafon is an airborne demining system aiming to clear all landmines around the world in less than 10 years. Mapping, detecting and destroying landmines using Mine Kafon is up to 20 times faster, 200 times cheaper and immeasurably safer than currently available technologies. East Hawk: a multi-perspective constant aerial surveillance system (M-CASS) with a 3-D wireless charging platform; suitable for disaster search and rescue as well as large VIP events. Customizable Drones: An environment-friendly Parking Operator and traffic Control Drone with long range RFID connected to a serial data transmitter which can detect parking tags and send the information to parking operators, immediately updating the toll system. This drone can detect 50 tags per second, compared to manual checking by an operator of 50 vehicle checks in 30 minutes. Sa3ed: drones equipped with remote controlled launch mechanisms and thermal cameras, propelling various items into a danger zone, including special purpose fire extinguisher grenades, or surrogate drones to scan the surrounding area and send crucial and timely information to the command center. IORTA (Smart Oil-Spill Solution Using Drones): the aim of this project is to reduce damage to marine ecosystems after an oil-spill by using the drones to deploy a natural, lab-tested and non-toxic absorbent “Spill-Sorb”. Each drone is assigned to a particular area for spraying, avoiding obstacles and collision with other drones and people by using an ultrasonic sensors feature. Spider Drone: with a design inspired by the ballooning spider which uses strings to attach to trees or structures to move long distances in windy conditions, this aerial robot can stabilize itself in flight using self launched strings, attaching to surfaces to perch for periods of time in adverse weather conditions. In a construction context, this can allow close inspection of large structures in remote aeras, site inspection, surveying, health and safety inductions and automated surface sampling. TwingTec: Wind Energy 2.0: for the more than 1.3 billion people living in remote parts of the world with limited or no access to electricity, this technology will provide them with the opportunity to harness the environment-friendly power of their natural, local resources. The Twing is automatically deployed from the transportable ground station to harness wind energy hundreds of meters above the ground. USAR Drone – 4Front Robotics: UAV equipped with gas sniffers, environment quality monitoring features and sensors to locate victims as well as ability to remotely monitor a human’s vital signs, this Urban Search And Rescue drone will be a great help in trying to locate and rescue people from buildings on fire, collapsed buildings, mines, and other urban and industrial entrapments. Wingcopter: Powerful and versatile hybrid drone made to save lives faster in emergency situations. It can be vertically launched and landed from anywhere, even from the back of a car. Upon arrival to the scene of an accident, the Wingcopter can transmit live footage straight to the control station, exponentially increasing the chances for SAR teams to make faster and more accurate decisions. With drone technologies advancing so swiftly, we can be pretty sure that next year’s UAE Drones For Good Award will bring out such brilliant minds and innovative projects which right now are probably still beyond our comprehension. We are certainly looking forward to that!